BeFlexi is pleased to announce our latest expansion into the Australian market. Australia is the 24th largest export economy in the world and has major opportunities for wine, edible oil and other food grade product export. Last year exports amounted to US$442 billion. Just last week, our flexitanks arrived in Melbourne, Australia, which signifies our sixth continent of flexitank operations and 26th country! Our flexitank stock is safely stored at the warehouse of our logistics partner in Melbourne and is ready to be forwarded to any destination around the globe. We cannot wait to explore this market. 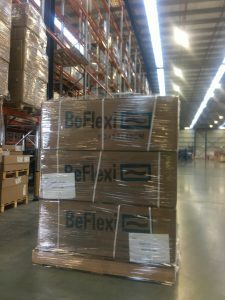 BeFlexi’s flexitanks in Australian warehouse. Andreea Manaila, our Sales Executive says, “I am really glad we are taking it to the next level with the Australian markets. We had several requests in the past but now we are on the verge of our very first projects there. I am really looking forward to see the development of this’’. At BeFlexi, we’re driven by a global commitment to sustainable logistics and fair trade. Currently, there are thousands of tons of non-dangerous liquid and dry cargo being distributed in bulk, but which could be switched to the more cost-effective and less risky flexitank solution. Together with logistics companies, we aim to deliver this innovative flexitank technology and know-how to end consumers around the world. We now look forward to further developing relations with key logistics companies in Australia and increasing our presence there.